QUINCY — Twelve-year-old Alp Yokus and his parents sprang into action Friday morning when the tide began to rise near their Sea Street home. They gathered important household items on the first floor and brought them upstairs to protect them from flood damage. Then they anxiously waited, as the tides surged higher. Finally, they had to leave. But they needed the help of the tireless Quincy first responders who scoured city streets all day looking for residents endangered by floodwaters. Firefighters, Yokus said, spotted his family outside their home and brought them onto a rescue vehicle to safety. There’s another high tide just before midnight, and that one is expected to be worse. “They, like, lifted us up,” Yokus said, adding that he planned to spend the night with an aunt. A similar scene played out on Gannett Road Frank Meroney rushed to his uncle’s house to help him corral his boat, which had floated onto the street amid the flooding. They tied the vessel to the house and then focused on his uncle’s basement, which was in dire condition. A mother, child, and dog were rescued from a flooded home on Post Island Road in Quincy on Friday. So crazy, in fact, that Quincy police took to social media as the storm raged to emphatically tell residents to get off the roads, lest their cars become submerged. 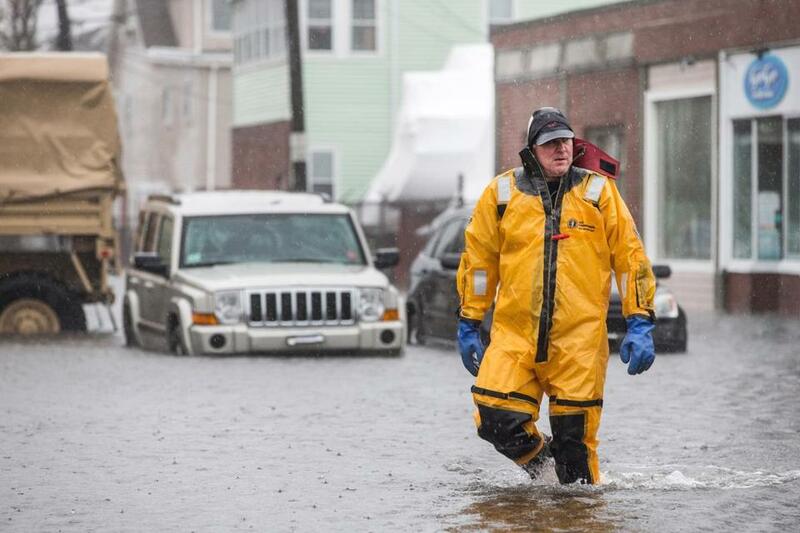 Among the hardest-hit areas were McGrath Highway, Southern Artery at Brackett Street, Sea Street at the Houghs Neck split, and East Squantum Street, officials said. In one stark warning of the danger inherent in trying to brave floodwaters by car, Quincy police posted video of a submerged vehicle. Police tweeted that rescues were being made across the city. They also retweeted a photo of flooding on Conant Road and Quincy Shore Drive, where tides crashed over the guardrail. 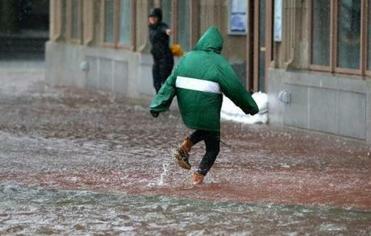 The city has shelters open at the Squantum School, Atherton Hough Elementary School, and Quincy High School, Mayor Tom Koch said in a video posted to Twitter around 6 p.m. Friday. About four dozen people were in those shelters at that time, he said. “Those places will be available if you have no place to go,” said Koch. Koch said National Guard units are also working in Quincy tonight to assist in evacuations of residents from flooded areas. As of 9:32 p.m., 8,944 customers were without power in Quincy, according to the Massachusetts Emergency Management Agency. High tide was expected around midnight, with another tide anticipated around noontime Saturday that will reach 13 feet with the storm surge, said Koch. He asked curiosity seekers to stay away from the waterfront and coastal areas tonight so they don’t impede emergency workers. “Safety is number one. We don’t want unnecessary things to happen tonight. We got enough challenges without those folks who are just curious about what is going on,” said Koch. Lauren Gilmartin, 18, who lives on Seashore Road in Quincy, said by phone that her home was getting doused by flood waters. Quincy wasn’t the only coastal area having problems. Waves crashed against the seawall along Turner Road in Scituate on Friday. 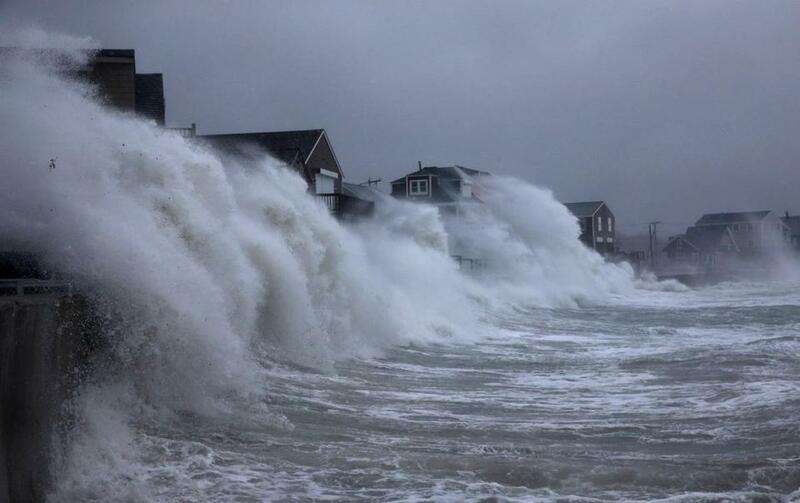 In Scituate, huge waves pounded against the seawall along Turner Road throughout the morning, and furious winds blew. Town workers erected barricades to the entrance to Lighthouse Road to keep motorists and curiosity seekers out of harm’s way. During an afternoon briefing, Scituate officials said the town — normally buffeted by wind, rain, and storm surge — survived the mid-morning tidal period without any major issues. But authorities warned the worst was yet to come and pleaded with evacuated residents not to return home until after the noon tide Saturday. “The biggest message here is not to go back to your homes,’’ fire Chief John Murphy said. Officials said the high tide set to arrive around midnight would probably create a much more perilous situation for residents. At least 185 people had evacuated their homes by Friday afternoon. In Marshfield, two residents were evacuated from their homes and taking shelter at a local warming center, fire Chief William Hocking said. He said one woman was injured as firefighters helped her out of her car in a flooded area. She was taken to an area hospital with injuries that weren’t life-threatening, Hocking said. 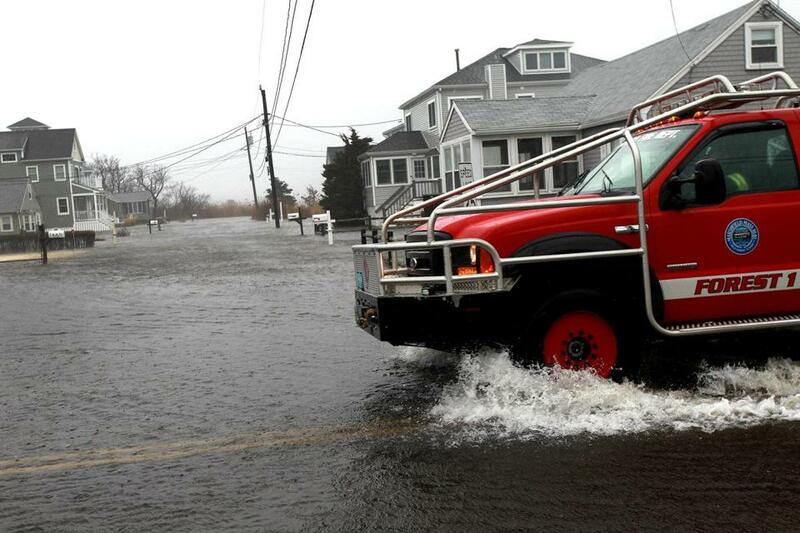 In Revere, emergency crews advised residents in low-lying areas, particularly Beachmont and the Point of Pines Riverside, to use caution and remove vehicles from vulnerable spots. Winthrop Parkway was closed at the flood gates. Irene Leon Catcher, a longtime resident of Pearl Avenue, said Friday’s flooding was far worse than the January storm, which left her with $20,000 in damage to her furnace and water heater, and totaled her car. High winds blew the shingles off her home before noon Friday. Meanwhile, streets around the Beachmont School on Bennington Street flooded, leaving several teachers’ cars underwater, Revere police Chief James Guido said. School was in session and the kids were safe, he said. He said he was “very concerned” about the midnight tide. “We advise anyone along the coast to leave the area,” Guido said. Firefighter Bill Brogan wore a dry suit as three people and two dogs were rescued from two cars that got stranded beside each other on Shirley Street in Winthrop on Friday. 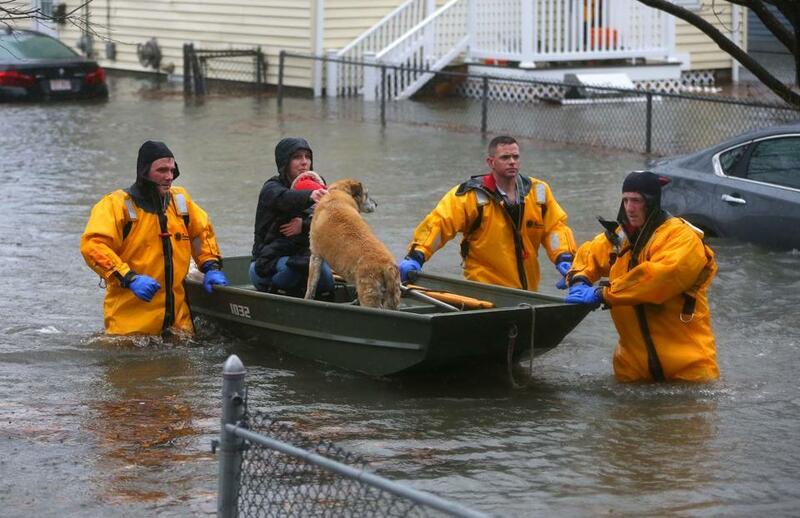 In Winthrop, firefighters rescued three people and two dogs who tried to drive through flood waters near the intersection of Shirley and Tewksbury streets, Fire Chief Paul Flanagan said. Another man was rescued after his Dodge Charger became submerged in about 3 feet of water after flooding from Belle Isle Marsh inundated Morton Street, Flanagan said. Firefighters were summoned to the area around 10:57 a.m. after a police officer saw the man sitting in the flooded vehicle. The town opened a shelter at its senior center. At midday, there were five people there, Flanagan said. Fire Captain Scott Wiley said about 15 people had to be rescued. The National Guard as well as extra ambulances were called to assist the department. Wiley said they plan to continue regular storm protocol through Saturday, and begin pumping water out of residents’ homes after the storm passes. Back in Scituate, Bob Gallagher, the lightkeeper at Old Scituate Light, a historic lighthouse in town, hunkered down in the afternoon with his wife in the cottage. An adjacent parking lot was underwater. Gallagher, a teacher, spent the day correcting papers and said the parking lot floods about once a month. He said he and his wife planned to remain in the lighthouse throughout the storm, noting they’ve only been forced to evacuate once in nine years. A new seawall was built in 2013, Gallagher said, and it protects the couple from the elements. By 1:30 p.m., Gallagher said the tide appeared to be receding — temporarily, at least. “We’ll see what the second tide brings,” he said. Globe correspondents Elise Takahama and Laney Ruckstuhl contributed to this report.